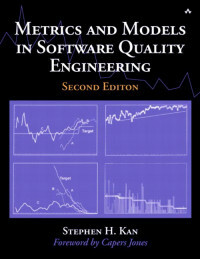 Metrics and Models in Software Quality Engineering, Second Edition, is the definitive book on this essential topic of software development. Comprehensive in scope with extensive industry examples, it shows how to measure software quality and use measurements to improve the software development process. Four major categories of quality metrics and models are addressed: quality management, software reliability and projection, complexity, and customer view. In addition, the book discusses the fundamentals of measurement theory, specific quality metrics and tools, and methods for applying metrics to the software development process. In addition to the excellent balance of theory, techniques, and examples, this book is highly instructive and practical, covering one of the most important topics in software development--quality engineering.